• iTunes server seemed to drop off line and the service needed to be restarted. It's been two years since we last reviewed a LaCie NAS. That's not because LaCie has stopped producing new models, but more a reflection of reader interest. In spite of the sleek Designed-by-Neil-Poulton physical design, LaCie NASes have offered little to spark reader interest. Performance has been uncompetitive and feature sets have paled beside the lets-make-it-do-everything approach of QNAP, Synology, NETGEAR and others aiming for the same wallets. So when LaCie once again asked nicely if we would review their latest five-bay NAS, we initially demurred. But after a visit with LaCie at Seagate's (LaCie's new owners) demo suite at CES and promises that this product was really different, we relented and agreed to review the 5big NAS Pro. 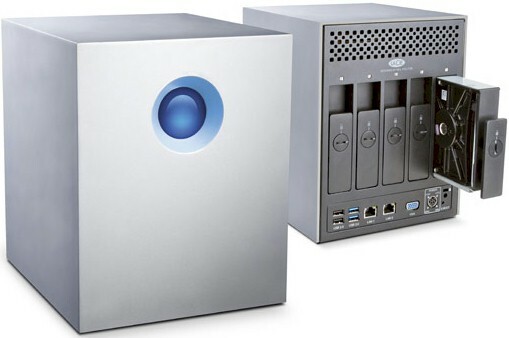 The 5bigPro, as I'll refer to it in this review, looks like every other five-bay NAS that LaCie has produced. It still looks like it was carved out of a large block of aluminum, with a matte finish that you'll need to work at to get it to show fingerprints. There is still a big ol' lighted blue button on the front that alternates with red when there is a volume failure. The rear panel of the 5bigPro is shown below. You get two USB 2.0 ports, two USB 3.0 ports, dual Gigabit Ethernet ports and a VGA port. There are no eSATA ports and no HDMI. It looks like LaCie traded in the two eSATA expansion ports found on the previous version, the LaCie 5big Network 2 for the pair of USB 3.0 ports. The two Ethernet ports can be configured for 802.3ad link aggregation or in failover. As with previous models, jumbo frames are not supported. Each of the five hot-swappable eSATA drives has a two-color LED, and each drive “locks” into the case using a coin or the supplied LaCie “disk key”. LaCie has finally realized that you can't use a Marvell platform for a RAID5 NAS if you want to play with the big boys. The 5bigPro's hardware platform looks more like the current crop of business / prosumer NASes being based on Intel's dual-core D2700 Atom. LaCie also realized that you need lots of memory for good performance, and has included plenty of RAM—4 GB—and included 4 MB of flash. This compares favorably with the 512MB or RAM and 512KB of flash found in the previous version. Yes, you can get a LaCie five-bay NAS apart and the board photo below proves it! The photo isn't good enough to identify the components, but I've done that in Table 1 below. The 5bigPro isn't designed for the lowest manufacturing cost, since separate power and data cables are used to connect the drive backplane and main board. But once you get the outer shell off, the board comes out pretty easily. If you went through all that trouble and wanted to throw another soDIMM into that empty socket you see above, you'd be violating your warranty. Our 10 TB review sample came with five Seagate Barracuda 7200.14 2 TB (ST2000DM001) drives. Power consumption measured 47W with four drives spun up and 21 W with them spun down for power save. Noise level was rated low, with a small amount of drive noise audible in a quiet home office. RAID 5 rebuild time was reasonable, taking 13.5 hours to rebuild a 4 X 2 TB array. Unlike its predecessor, out of the box, the 5bigPro comes configured for SimplyRAID. SimplyRAID is a hybrid RAID technology which, like most other RAID levels, provides fault tolerance. However, with SimplyRAID, you can install disks of different sizes, and can upgrade storage capacity without moving or deleting data. The RAID section of the user manual provides a fairly good description of SimplyRAID. While this hybrid RAID structure is new to LaCie, it's not unique. Synology also has similar technology (Synology Hybrid RAID) built into their multi drive NAS products. The device also supports RAID 1, 5, 5+hot spare, 6, 6+hot spare. The supplied review unit was a 10 TB model (5drives X 2 TB). Configured with SimplyRAID, the net available storage after accounting for tolerance is 6 TB. If you created a SimplyRAID volume with only single drive protection, you'd gain the storage space of another drive, for a total of 8 TB with the 10 TB model. Migration is supported in the SimplyRAID mode only. To get started, you install the LaCie Network Assistant. This small program identifies the 5bigPro on the network, provides a link to the web-based UI, and helps you map drives. Windows, Mac and Linux versions of the Network Assistant are included. We are not fans of requiring programs to be loaded on computers to install network devices, especially those that come on CD. But at least you can download the assistant from LaCie's website. The image below shows the Dashboard (landing page) of the 5bigPro. The widget-based user interface is identical to what I found on the LaCie 5big Network 2 reviewed here. The 5bigPro has a total of 12 widgets– one for each of the main menu entries.